Nigeria’s senior national football team The Super Eagles heading to the World Cup in Russia and are doing so in style, but is there substance? 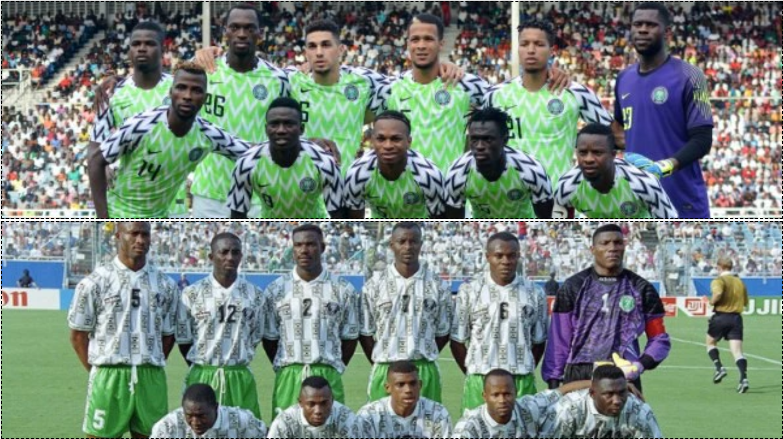 24yrs after participating in their first outing at the USA 94, the name of Nigeria’s football team was on the lips of every sport loving person, thanks to the NIKE jersey that sold out within minutes of it launching. The 1994 Adidas jersey was equally impressive, there was no known poll that year, but that jersey would probably be one of the best. A poll conducted by Skysports credited the 2018 Nike jersey as the best of the 32 countries. This is about the only similarity between the 1994 and 2018 squads. the two teams differ in depth and qualities. The 1994 squad had qualities in every position and had just won the African Nations Cup in Tunisia earlier in the year. The team went on to top its World Cup group which included Maradona lead Argentina, Stoichkov lead Bulgaria, and a strong Greek side, defeating Bulgaria 3-0, Greece 2-0 and narrowly losing 1-2 to Claudio Canniggia brace helped by Maradona’s trickery. The Rashidi Yekini, Daniel Omokachi, Samson Siasia, Emmanuel Amuneke and Finidi George lead Eagles narrowly lost to Italy and missed the Quater final spot following Roberto Baggio Brace. The 2018 Squad going by the warm-up games so far have not shown signs of a team capable of causing upset, losing to Serbia, England, and the Czech Republic in the pre-tournament warm-up games. It can definitely be argued that friendly matches are not a good yardstick to measure readiness or predict performance at the World Cup but should give some insight into the shape of the team and that so far is not encouraging. A reported infighting between Captain Mikel Obi and Vice-Captain Onazi, prompting the NFF to tweet an apparent video demonstrating a cordial relationship between the pair will be under scrutiny and can potentially cause damage if true. This squad doesn’t look too promising. I don’t have them making it out of their group because Iceland and Croatia are quite tough. They may surprise many, however. I agree with you, football standard has dropped. Look at the calibre of clubs the current squad plays for? Very true. The club representation is not the best.